So, you’ve been invited to a friends place for a casual dinner, there will be a couple of you so you usually dress to impress! You arrive at your friends place and you realize there is something different about their place. What is it? You mysteriously wonder!!! You work out that it’s their front landscape. They have done it up and boy does it look great. Why Natural Stone Pavers You Ask? Water eroding the shore lines of rivers, beaches and lakes. Removal of natural salts contained in the stone. Natural stones once found are quarried then take to factories all over the world. They are then modified in texture, shape and produced into pavers. They are then sold world wide and applied to many residential home applications such as; driveways, walkways, patios, pool areas and just about anywhere else you can think of. What Do Natural Stone Pavers Offer Us As Homeowners? We all like our homes to look beautiful and all in our own styles. Our front yards are the most looked at part of the home simply because they are out the front. A wonderfully landscaped front yard is perfect. Beautiful flowers, plants, water features and pavers are all part of our front landscape. Natural stone pavers can be applied anywhere around the front of your home as a; driveway, walkway, sidewalk or pathway. They are the perfect choice because they offer many natural qualities that can not be matched by any other man made product. They offer many stunning colors that are naturally produced by the wonders of nature. Because of this no 2 natural stone pavers will run the same in color making your natural stone application your own individual style. They also offer us many creative shapes. Shapes are important because they produce the overall pattern that the outlook of your application will look like. You can have your own custom made shapes to create your own styled pattern, or you can stick to some of the more basic shapes like squared pavers and rectangular pavers its all your own choice. Durability and strength are a very important attribute that is need when choosing the right pavement material for your residential application. 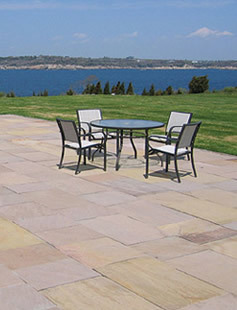 Natural stone pavers a high in durability and offer much needed strength. Strength is the most important quality which is needed on a driveway and walkway because of the vehicular traffic and foot traffic. 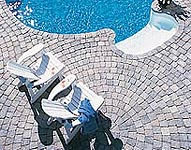 Natural stone pavers are easily maintained by the homeowner. There are also many cleaners and sealers available for you to upkeep the uniqueness of natural stone pavers. Hopefully this article has helped and made up your mind that choosing to use natural stone pavers anywhere around your home is the right choice. They will last you a lifetime and more making them the most cost effective purchase you will make in your life time. Visit a local retailer and view all the many types of natural stone pavers which offer natural beauty, strength, durability and versatility. This entry was posted in Benefits of Pavers and tagged paver benefits, paving stones. Bookmark the permalink.